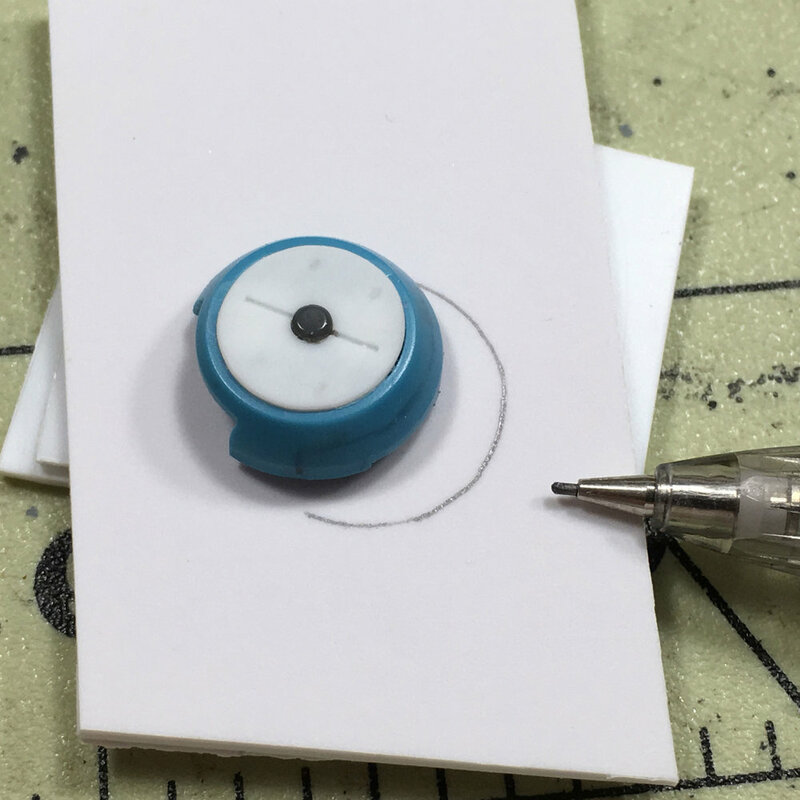 In this Creative Tip I'll show you how to apply new panel lines to edges of hard to scribe parts like circular details. 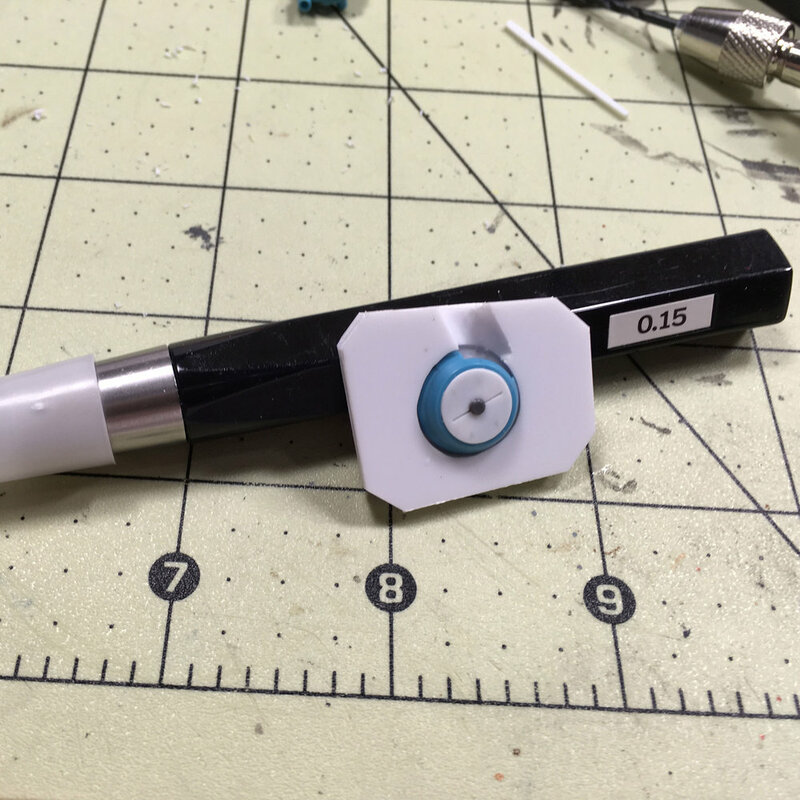 I wanted to apply a new panel line around the beveled edge of this ear piece to the MG GM Sniper II, but with this type of shape you can't just put on DYMO tape and scribe it. You have to get creative. I want the new panel line to align with the seperation so the best way to tackle this is to make a scribing jig. 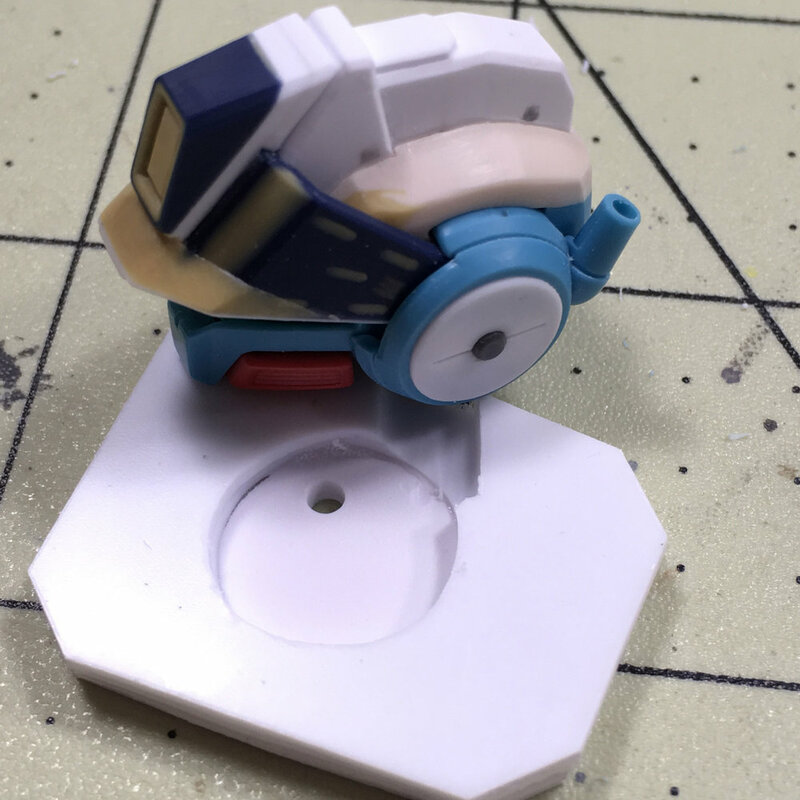 Jigs in the woodworking world are very common to aid in making cuts, align parts, or dill holes, so we'll be brining that thought process over to Gunpla. Let's start off with some supplies that you'll need. First, you'll need some scrap plastic sheet. 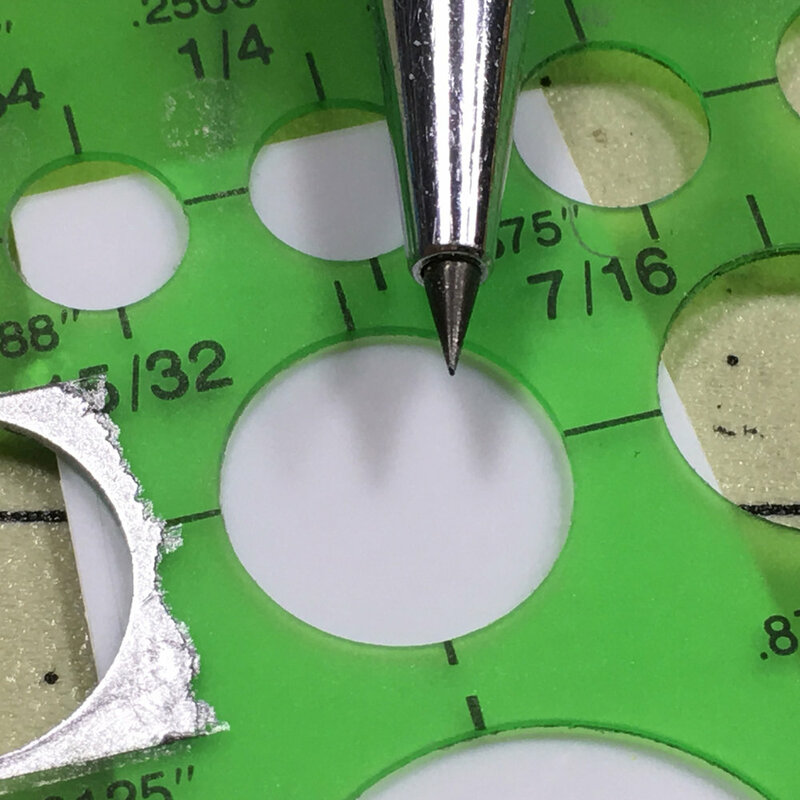 A good circle template to find the approximate diameter of the part. 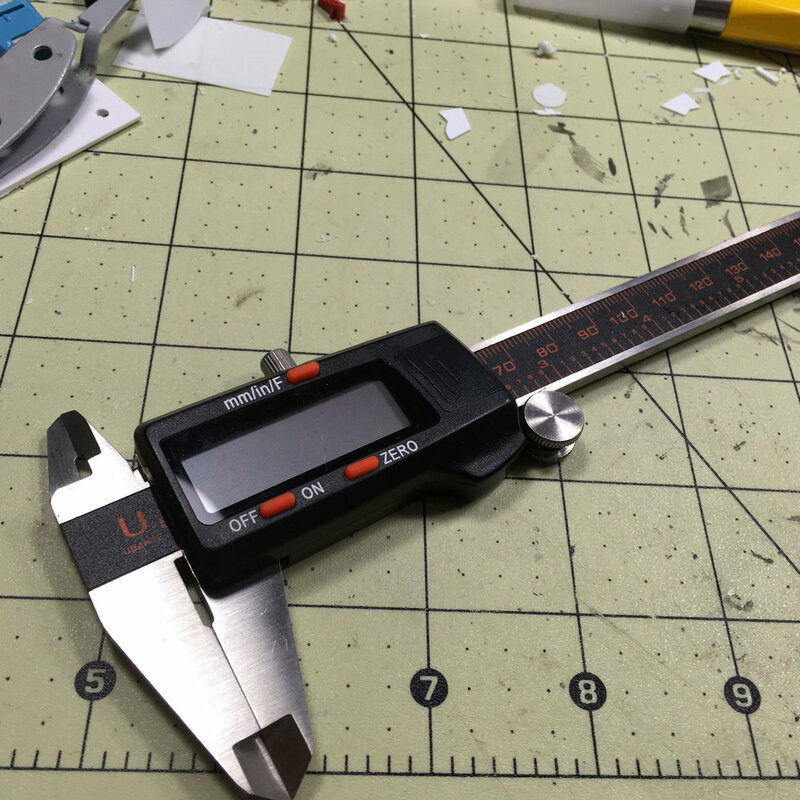 A digital caliper to find exact mearsurements. A pin vise and a set of drill bits. A scribing tool to mark lines. Super glue to glue all the parts together. A hobby knife or utility knife to cut the plastic sheet. A rotarty tool, like a Dremel, with a cylindrical grinding bit for shaping. A selection of chisels. Here I'm using .15mm and .3mm. The first thing we'll have to do is measure up from the base of the piece to where we want the panel line to be. In this case it's exactly 2mm up from the base. With the circle template, we'll need to find the approximate diameter of the piece. It doesn't need to be exact; just close enough. Having just a bit of space around the piece is perfectly fine. Using the scriber tool we'll next start to scribe the circle into the plastic. You can either try to scribe all the way though or use it as a guide and grind it out with your rotary tool. 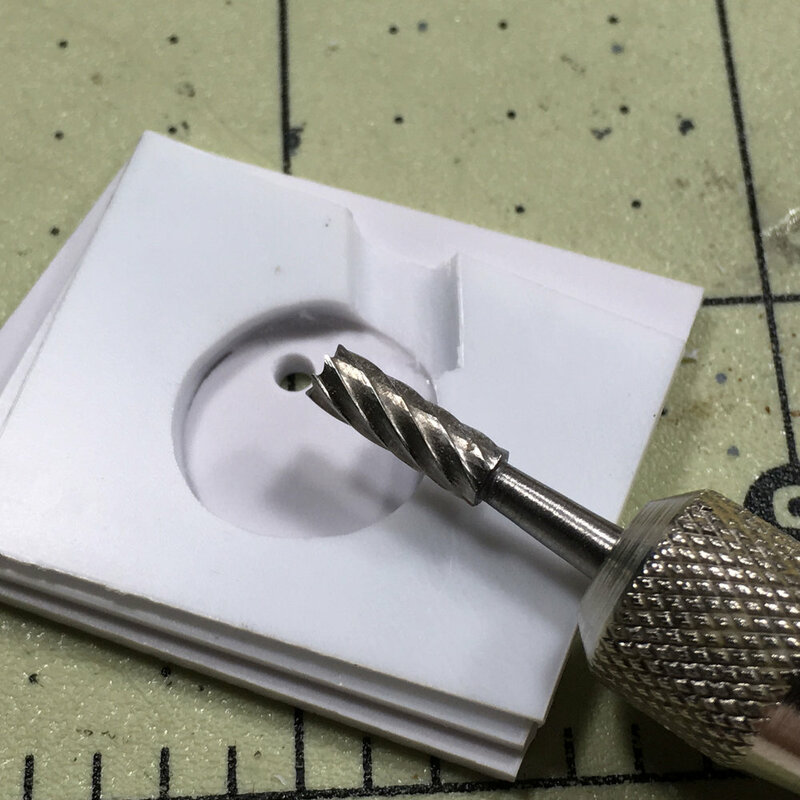 You could also drill the hole, but with a piece this small, it might be difficult and/or unsafe. 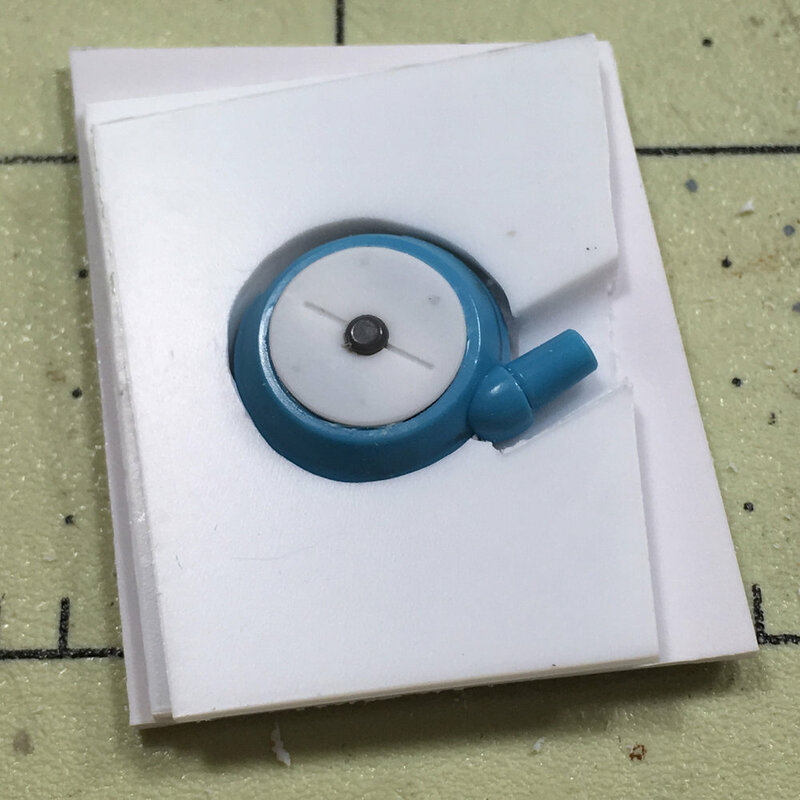 Since the height of the new panel line is 2mm, we'll make the same circle into two pieces of 1mm plastic sheet. This will give us a perfect guide height. One issue with this particular piece is the connecting rod, so we'll have to compensate for that. Since it won't sit flush with the base of the jig, we'll have to drill a hole in the base for it to sit in. To drill the appropriate sized hole, we'll need to find the diameter of the connecting rod. This is where the digital caliper comes in. Once we've got the diameter size, we'll need to find a drill bit with the same approximate diameter. This also doesn't have to be perfect, just big enough to fit the rod. Now that it sits flush with the base, we can go about making the rest of the jig. Next, we'll pop the piece into the hole and center it as best as you can to the base. Once it's centered, trace the outside of the piece. Start to stack and glue the pieces with the holes onto the traced edge. Now that we have the jig assembled, we've got another issue to tackle. The corresponding ear piece has the antenna, so that won't sit flush with the current jig. To compensate for this we'll need to grind a bit of plastic out for it to fit. We'll trace the outline of the antenna to get the area that we'll have to grind away. Grind the area with your rotary tool. Just a bit bigger than the antenna, and just a little deeper so that the antenna doesn't come into contact with the jig. Now the piece sits flush. I like to trim the excess plastic and trim off the corners so I can grip the piece easier. You don't have to do this. I just prefer it. With the jig done we're ready to scribe it. For this line I'll be using a .15mm. I find this is a great size for panel lines on 1/100 scale models. The piece is set in the jig and it's ready to scribe. The best thing to do is to let the jig guide your chisel and let the chisel do the work. Work in smooth, even, short strokes. Your hand will tend to lift off the jig at the backend of your stroke so be very careful of this. That's why short strokes are best to get the line started. After that, you can go back and go a bit deeper. After you've got your line scribed, go over the surface with some sandpaper to clean it up. Once sanded it should look like this. You'll eventually want to wet-sand this part to get a really smooth surface for painting. Here's how the left ear piece came out. And here's the right ear piece. Perfectly matched. To accent the new panel line and set off the design element we'll add some notches to simulate panel latches. By combining lines and notches really makes the piece pop. Here I used a .3mm chisel for the notch. And here we have a finished piece with our new edge scribes. 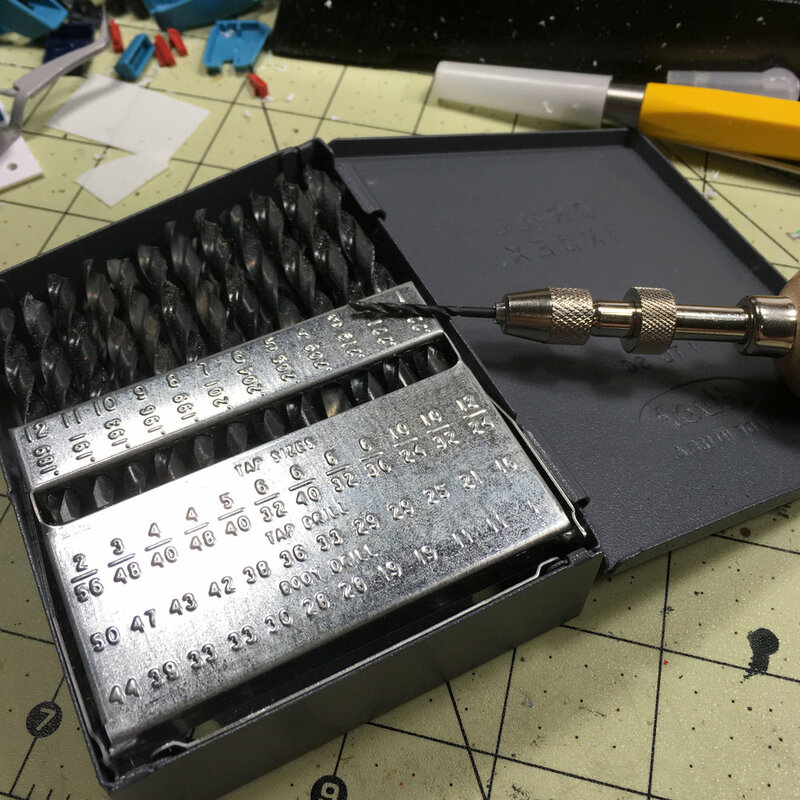 Using a jig will allow you to duplicate lines on other pieces as well. Just add this technique to your skill set and the next time you have a tricky piece to scribe you can use this. Some companies make tools for something like this, but if you don't have those tools this is the perfect solution. Also, depending on the piece, those tools may not be accurate enough or even work in your particular situation.